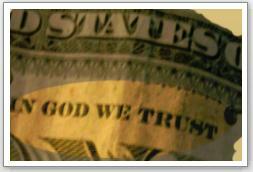 $700 Billions in Print with IN GOD WE TRUST! IN GOD WE TRUST will soon be printed on the 700 billion dollar bills by the US Treasury Department’s Printing Press to help save the “not-making money” companies (Financial System) from bankruptcy because of bad debts, bad loans and the evil practices of capitalism. The possible bailout of these companies from bankruptcy using the taxpayers’ money: $700,000,000,000 billions of dollars printed with IN GOD WE TRUST, really sounds like the Economic 101 concept and definition of Socialism and a little taste of religion – giving, sharing and forgiveness. There is an ongoing debate and testimonies and investigation to this mess but at the end of the day, something has to be done- that is the AMERICAN WAY! The upcoming bailout of this magnitude has made the stimulus package few months ago an example of what “CRUMBS” would look like in its real sense. Yes, not long ago we enjoyed the crumbs and now its their turn to enjoy the real JUICE! – The huge chunks of dough! All of these can only be possible because…”IN GOD WE TRUST!” and most of all the classic evangelistic Armageddon scenario of global economic hell.